Valid for NEW DIRECTV customers only. 12 Month TOTAL CHOICE® Programming commitment is required. Get Standard One Receiver Professional Installation included with one year programming commitment. WKB10B1 RCA UltimateTV® Universal Wirless Keyboard. 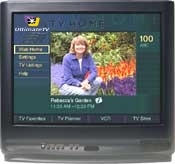 Operates All UltimateTV and WebTV Receivers including Philips. DWD-495RG Receiver with UltimateTV Service, dual tuner, PIP, watch one channel and record another one or watch 2 different shows at once, Dolby Digital, pause Live-TV and 70 hours of record time*. *Actual recording capacity depends on type of programming being recorded. DS-4290RET/DWD-490RE 2-Room DIRECTV Multi-Satellite System with UltimateTV Service, dual tuner, PIP, watch one channel while recording another one or watch 2 different shows at once, Dolby Digital, pause Live-TV and 35 hours of record time*. With a 18" x 24" Elliptical Dish for receiving multiple satellites!,(2) Dual Output LNBs (with a socket for a third "SAT#C" LNB), Multi-Switch for connecting up to (4) DIRECTV Receivers, Mounting Bracket, Instructions. *Actual recording capacity depends on type of programming being recorded. For New DIRECTV Customers. Includes Self Installation Kit. You must activate the DIRECTV and UltimateTV services to qualify for this offer. DS-4290RE/DRD-430 2-Room DIRECTV System with UltimateTV Service, dual Tuner, PIP, Dolby Digital. Watch one channel while recording another or watch 2 different shows at once, pause Live-TV. Has 35 hours of record time*. With a Dual LNB 18" Dish. Includes the top-of-the-line RCA DS-490RE DIRECTV System with an extra standalone Receiver DWD-430RG and IR Remote. *Actual recording capacity depends on type of programming being recorded. For New DIRECTV Customers.Standard One Receiver Professional Installation included with one year programming commitment. You must activate the DIRECTV and UltimateTV services to qualify for this offer. DS-4290RE/DWD490 2-Room DIRECTV System with UltimateTV Service, dual Tuner, PIP, watch one channel while recording another one or watch 2 different shows at once, Dolby Digital, pause Live-TV and 35 hours of record time*. With a Dual LNB 18" Dish. *Actual recording capacity depends on type of programming being recorded. For New DIRECTV Customers. Standard One Receiver Professional Installation included with one year programming commitment. You must activate the DIRECTV and UltimateTV services to qualify for this offer. DS-4295RG/DRD-430RG 2-Room DIRECTV System. Includes the top-of-the-line RCA DS-495RG DIRECTV System 70-Hour Record Time* with UltimateTV Service, dual Tuner, PIP, Dolby Digital, watch one channel while recording another one or watch 2 different shows at once, pause Live-TV. With a Dual LNB 18" Dish. Also includes an extra Basic Standalone Receiver DWD-430RG and 2 IR Remotes. *Actual recording capacity depends on type of programming being recorded. DS-4290RET/DRD-430RG 2-Room DIRECTV Multi-Satellite System with UltimateTV Service, dual tuner, PIP, watch one channel while recording another one or watch 2 different shows at once, Dolby Digital, pause Live-TV and 35 hours of record time*. With a 18" x 24" Elliptical Dish for receiving multiple satellites!,(2) Dual Output LNBs (with a socket for a third "SAT#C" LNB), Multi-Switch for connecting up to (4) DIRECTV Receivers, Mounting Bracket, Instructions. Includes the top-of-the-line RCA DS-490RE DIRECTV System with an extra Standalone Receiver DWD-430RG and IR Remote. *Actual recording capacity depends on type of programming being recorded. DS-4290RE/DWD490-2 3-Room DIRECTV System with UltimateTV Service, dual Tuner, PIP, watch one channel while recording another one or watch 2 different shows at once, Dolby Digital, pause Live-TV and 35 hours of record time*. With a Dual LNB 18" Dish. *Actual recording capacity depends on type of programming being recorded. DS-4290RE/DWD490-3 4-Room DIRECTV System with UltimateTV Service, dual Tuner, PIP, watch one channel while recording another one or watch 2 different shows at once, Dolby Digital, pause Live-TV and 35 hours of record time*. With a Dual LNB 18" Dish. *Actual recording capacity depends on type of programming being recorded. DS-4295RGT/DRD-430RG 2-Room DIRECTV Multi-Satellite System. Includes the top-of-the-line RCA DS-495RG DIRECTV System 70-Hour Record Time* with UltimateTV Service, dual tuner, PIP, watch one channel while recording another one or watch 2 different shows at once, Dolby Digital, pause Live-TV. With a 18" x 24" Elliptical Dish for receiving multiple satellites!,(2) Dual Output LNBs (with a socket for a third "SAT#C" LNB), Multi-Switch for connecting up to (4) DIRECTV Receivers, Mounting Bracket, Instructions. Also includes a Basic Standalone Receiver DWD-430RG and 2 IR Remotes. *Actual recording capacity depends on type of programming being recorded. DS-4295RG/DWD-495RG 2-Room DIRECTV System with UltimateTV. Includes 2 top-of-the-line RCA DWD-495RG DIRECTV Receivers (70-Hour Record Time)* with UltimateTV Service, dual Tuner, PIP, Dolby Digital, watch one channel while recording another one or watch 2 different shows at once, pause Live-TV. With a Dual LNB 18" Dish. Also includes 2 IR Remotes. *Actual recording capacity depends on type of programming being recorded. 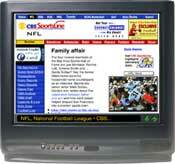 DS-4295RGT/DWD-495RG 2-Room DIRECTV System with UltimateTV. Includes 2 top-of-the-line RCA DWD-495RG DIRECTV Receivers 70-Hour Record Time* with UltimateTV Service, dual Tuner, PIP, Dolby Digital, watch one channel while recording another one or watch 2 different shows at once, pause Live-TV. With a 18" x 24" Elliptical Dish for receiving multiple satellites!,(2) Dual Output LNBs (with a socket for a third "SAT#C" LNB), Multi-Switch for connecting up to (4) DIRECTV Receivers, Mounting Bracket, Instructions. Also includes 2 IR Remotes. *Actual recording capacity depends on type of programming being recorded. DS-4290PKG DIRECTV System with UltimateTV Service, dual Tuner, PIP, watch one channel while recording another one or watch 2 different shows at once, Dolby Digital, pause Live-TV and 35 hours of record time*. With a Dual LNB 18" Dish. *Actual recording capacity depends on type of programming being recorded. FREE Keyboard with your purchase today. You must activate the DIRECTV and UltimateTV services to qualify for this offer. DS-4295RGT DIRECTV Multi-Satellite System with UltimateTV Service, dual tuner, PIP, watch one channel while recording another one or watch 2 different shows at once, Dolby Digital, pause Live-TV and 70- hour record time*. With a 18" x 24" Elliptical Dish for receiving multiple satellites!,(2) Dual Output LNBs (with a socket for a third "SAT#C" LNB), Multi-Switch for connecting up to (4) DIRECTV Receivers, Mounting Bracket, Instructions. *Actual recording capacity depends on type of programming being recorded. 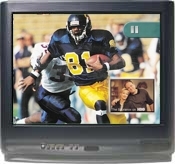 UltimateTV® service from Microsoft is the only service that combines digital video recording, live TV controls, interactive TV, Internet access, and DIRECTV® programming, in one receiver. 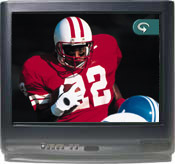 UltimateTV is available exclusively on the DIRECTV™ Receiver with UltimateTV service. 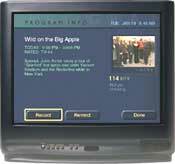 The DIRECTV Receiver with UltimateTV service is manufactured by RCA and Sony. *Scheduled to be available from either RCA or Sony. **Requires a monthly subscription to the UltimateTV service and is subject to acceptance of the terms of service upon registration. UltimateTV services are available as a local call in most areas. In some areas long distance telephone toll charges may apply. To check local access, click here or call 1-877-ULTIMATE (1-877-858-4628). For full functionality, this receiver requires connection of two satellite inputs from a dual output LNB DIRECTV satellite antenna; the second satellite input must be connected into the satellite receiver's Satellite 2 In Jack. 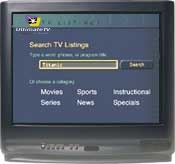 In order to access UltimateTV service, you will need the new DIRECTV Receiver with UltimateTV service. You will also need a dual output LNB DIRECTV satellite antenna to get full UltimateTV functionality. If you wish to keep using your current receiver in a different room, you will need to purchase an accessory called a multiswitch to provide feeds to all boxes. One finger is all you need to digitally record and store up to 35 hours* of TV programs. No more video tape. Use the Advanced Program Guide™ from DIRECTV to find out what's on when—up to 14 days in advance. Search for your favorite actor or type of movie and it instantly finds the stuff you love. UltimateTV puts you in charge! Enjoy the freedom of pausing a live DIRECTV® program for up to 30 minutes -- then come back and pick up right where you left off. Create your own instant replays and relive the excitement of a tie-breaking play with slow motion. Even watch two of your favorite live shows at once with Picture-In-Picture. Do just that. Instantly replay 7 seconds of anything you just saw on live TV with one simple press of a button on your remote control. The rest of the game or show will be there when you want to return to the live broadcast. Now you can use your TV in new and fun ways. Like sending e-mail, from the comfort of your couch. Or actually participating with your favorite shows. Use your TV to bounce- around the Web. With easy access to the Internet, you can surf the Net in the living room, shop online, check e-mail, or hit a chat room. Right from your TV. 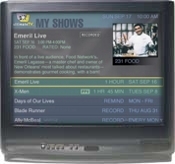 TV Listings are the ultimate guide to what's on TV, with a full seven days of on-screen interactive program listings for your area. You can find out what's playing now, or plan to watch a program later. Get more out of your favorite shows. With over 700 hours of interactive TV programming a week, you can play along with a game show, check stats while the game's on, or get more info on the latest newsflash. *Actual recording time may vary depending on the type of programming being recorded.